With ever increasing demand for animal protein, aquaculture is emerging as one of the most viable and promising enterprises to provide human nutritional and food security. But, most of the intensive aquaculture farms are facing major hindrance due to disease outbreak, poor growth and low survivals. To mitigate these problems, probiotics are being used in aquaculture practices. The use of probiotics in aquaculture not only resulted in the reduction of use of antibiotics in the culture systems, but also improved the appetite and/or biogrowth performance of the farmed species in an eco-friendly and sustainable manner (Gatesoupe 1999; Naik et al. 1999; Robertson et al. 2000; Wang et al. 2005). One obvious reason for the use of probiotics is that these can be supplemented even at larval and early fry stages (Muroga et al. 1987). 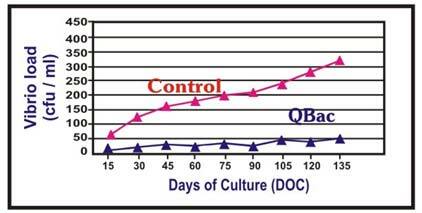 Several reports suggest that probiotics supplementation can reduce the cost of culture by improving the growth and feed utilization efficiency (Swain et al. 1996; Bogut et al. 1998; Ghosh et al. 2003; Carnevali et al. 2006; Wang & Xu 2006; Mazurkiewicz et al. 2007; Kesarcodi-Watson et al. 2008; Sugita, H. et al. 2009; Mehdi Yousefian et al. 2009; Zhang, Q. et al. 2010; Wang, Y, et al. 2011; K.N. Mohanta et al. 2012). With this proven concept in the background, Neospark is introducing a versatile probiotic formulation QBac for use in aquaculture. QBac is a dense Probiotic formulation fortified with Enzymes along with stabilizers and activators. The probiotic bacteria in the formulation will degrade many different substrates and do an excellent job in degrading the organic sludge that accumulates in Shrimp and Fish ponds. QBac acts on many diverse contaminating substances, digesting them down into more basic components through heterotrophic degradation that do not interfere with the farming process, which are more easily absorbed into the pond as well as surrounding environment, there by improves the water quality. QBac accelerates digestive process, formation of stable algae and also eliminate pathogenic micro-organisms and other undesirable substances. QBac competes with Vibrio and other opportunistic pathogenic bacterial species and controls their propagation in aquaculture ponds. QBac acts continuously there by restoring the life of the pond and its water quality, contributing to a better environment for the growth of Shrimp, Prawn and Fish during the crop period. All components in QBac are of natural origin. QBac’s multiple probiotic species act and minimise various sludge matter by heterotrophic degradation in aquaculture system either through aerobic or anaerobic path way. By the aerobic path way, probiotics of QBac use, O2 to oxidize the organic material by a metabolism similar to that of macrofauna and gain chemical energy. However, O2 content in the water is poor i.e. <0.0014% when compared to 21% of atmosphere. O2 pool is exhausted in the upper mm of aquaculture pond sediments*. Below the oxic horizon, a number of other oxidants become important like: NO3-, SO42-, and CO2. Whereas in the anaerobic path way the bacteria act without oxygen (anaerobic) on sludge and degrade the sludge. During the ecofriendly heterotrophic degradation activity of QBac the organic material gradually becomes degraded into the simple assimilable inorganic components, which get released in to the overlying water column where most of the plankton forms get benefited. The vertical position of the degradation pathways at the pond bottom sediment is mainly determined by the chemical energy and degradation pathways are sequentially structured as outlined below. NB: To maintain proper DO levels use OxyZen Pond Cake or AOP Plus (Neospark). 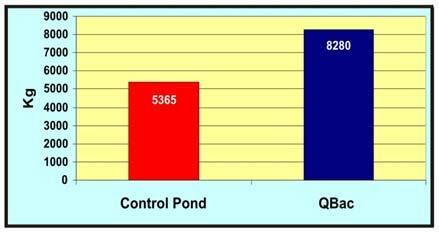 Multicenter field trials were undertaken at different commercial farm facilities using 2.5 acre grow-out ponds. Each pond was stocked with 2,50,000 PL 15 black tiger shrimp. A good quality and healthy SPF shrimp juveniles were selected by PCR test. Ponds were fortnightly assigned to standard dosage of QBac for a crop period of 135 DOC. Sampling was done at every fortnight for ammonia analysis, Vibrio sp. loads and collected data on survival, weight and total biomass of the shrimp at harvest. 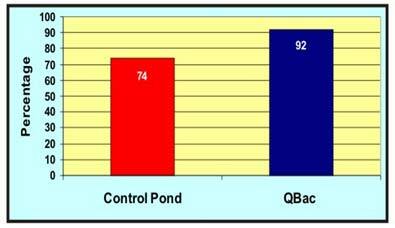 The aggregate results of this study shows that QBac was effective in controlling ammonia (Fig. 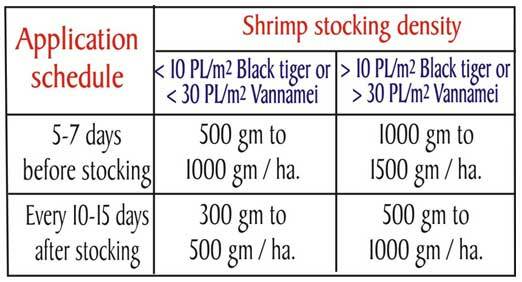 1) in shrimp culture system and improved the overall productivity of the system. The loads of Vibrio sp. were effectively controlled by QBac (Fig. 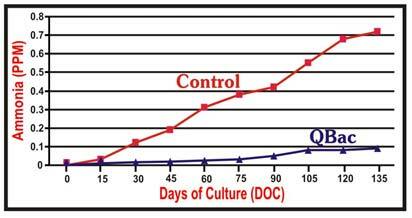 2) in shrimp culture system which indicates the increased survival and growth (Fig. 3&4). QBac is to be applied regularly to maintain proper probiotic density in aquaculture system for obtaining better performance. Degrades and reduces formation of sludge. exoskeletal moults and keeps the pond clean. moults and keeps the pond clean. Improves survival rates and productivity. Reduces chances of off-flavor problems. Improves and maintains water quality. Reduced water exchange. Lowering pumping and fuel costs. Reduced stress on animals. Lower levels of blue green algae. Reduced Vibrio and other bacterial disease problems- Healthier ponds. Better FCRs. Better management of water quality. Ensures rapid growth of post larvae. A potent combination of probiotics Bacillus subtilis, Bacillus megaterium, Bacillus licheniformis, Bacillus polymyxa, Bacillus pumilus, Thiobacillus denitrificans, Perococcus denitrificans, Acetobacter and Enzymes Protease, Amylase, Cellulase, Hemicellulase and Lipase with stabilizers and activators. Mix required quantity of QBac in around 50 liters of clean water from the same pond/hatchery tank and keep it for one hour before application to activate probiotics in the formulation. Broadcast the activated QBac throughout the pond/ hatchery tank and aerate the pond for better uniform distribution.